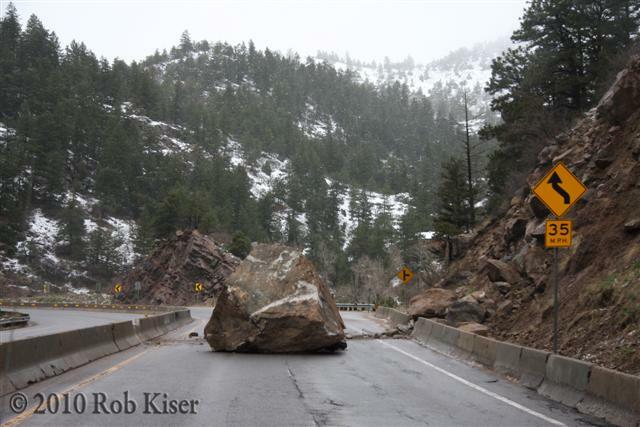 Jen and I were nearly killed in a massive rockslide on US Highway 285 today. 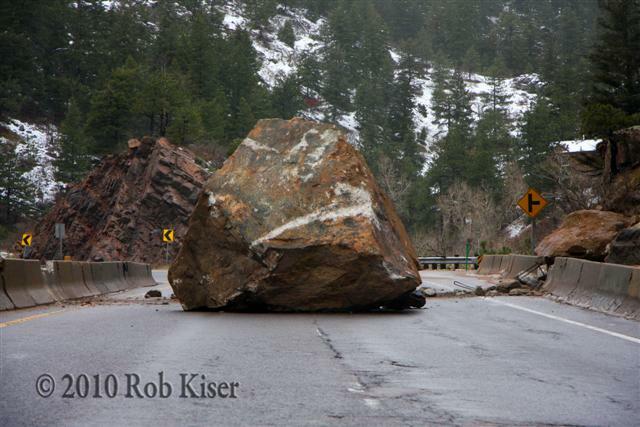 At approx 5:50 p.m. MDT, this boulder nearly hit the truck about 4 vehicles in front of us. We were able to escape without injury, fortunately, but were trapped in the narrow canyon. We couldn't go forward, and we couldn't go back. Fortunately, I was a boy scout, so I was prepared. I had extra gloves, ski bibs, hats, etc in the truck, so we got dressed in heaviest winter gear and hiked up the road a bit, past screaming police and authority figures, and Mark, my neighbor drove down and picked us up in his Audi. SO glad you're okay. Great shot. Saw the 10pm broadcast. You're so "right now"! Yay, I'm famous. I'd rather be rich.